The first Rugby Club was formed in 1945. Karl Mullen, an Irish International, brought a team down from Dublin to play the Gorey club and that was the start of rugby in Gorey. That match was played in a field owned by Malachy Travers of Ramstown. There were very few players in Gorey at that time, only boys who went away to school knew anything about the game. Florence Webb was involved at that time and is still alive today. Gorey would have only played homeleg games at that time and their base was Redmond's Hotel (now the Loch Garman Arms). That Club was disbanded in the mid-fifties and revived again in the late 1950s. This Club was more organised. The games were played in the Showgrounds. Some of the people who played with this Club were: Willie Willoughby, Mick Wafer, Garry Lombard, Slim Redmond, Herbert Stephens, Joe Finn and the Stokes Brothers. This Club was again dormant in the early 1960s. Willie Willoughby, Garry Lombard and Mick Wafer went to play with Enniscorthy for a few years. All games were played at the Show Grounds. Eric Deacon came to work in Gorey in the early 1960s. He was still playing rugby with Enniscorthy but in 1968 he decided to try to reform the club in Gorey. After speaking with a lot of people, it was decided to call a meeting in Redmond's Hotel. A good crowd turned up. The following were elected for run the Club: President - David Bolger, Captain - Gerry Slattery, Vice-Captain - Mick Murphy, Secretary - Eric Deacon, Treasurer - Mick Murphy, Committee - Aidan Grannell, Harry Halford, Fiach O'Byrne, Harry Bolger, Edward Henderson. Rugby was back in Gorey. Players returned from playing with Arklow and Enniscorthy. The next job was to find a pitch - one was identified and the Leinster Branch agreed to buy the grounds. The Committee decided on green, white and blue for the jerseys. Now there was a field to play in and a lot of jerseys! Tom Lambert's Bar (now the Coach House) provided the first home with shower, dressing rooms and Mrs. Lambert provided meals for visiting teams. After a few years - in the mid 1970s - the Club bought a timber building in Dublin and moved it to Clonattin. This building supplied us with two dressing-rooms, a kitchen and a function room. The Club was doing well. The Committee were now thinking of building a Club House of bricks and mortar. Plans were drawn up and Dan Tomkins, Builder, was given the job to build the new Club House. The timber building was retained for a few years. Then new dressing-rooms, a function room and kitchen were added to the Club House. Gorey was one of the first clubs to have a Club House in the South-East! Kathleen Cullen looked after all the cooking of meals in those early days. Gorey Rugby Football Club has done very well since it started, winning the South-East Cup on many occasions. The Provincial Towns Plate on a few occasions, and the Provincial Towns Cup 94/96 Season Junior IIII on one occasion. One member of the Club went on to star on the world stage playing for Ireland and Lions - that was Nick Popplewell. He was also named on the World XV. Other great players who played for Gorey were, to name just a few, Mark and Nigel Stephens, Brendan O'Gorman, Gerry Slattery, Roger Boyd and John O'Doherty all played for Leinster. Another man who has left an indelible mark in the club was Brian Redmond. Gorey RFC travelled to Oban in Scotland every second year and Oban came to Gorey to play rugby. Gorey RFC hosted Shearing '92, the National Championship, held in Clonattin in May and made some money. 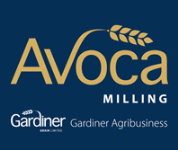 Some of the names involved were: Jim French, Bruce Copeland, Willie Poole, George Steacy and George Kidd. Gorey RFC hosted the first interprovincial match between Connaught and Leinster in November 1994. In 1996 Gorey Rugby Club were asked if they would stage the 1998 World Sheep Shearing event and the Club agreed. It took two years to plan. A committee was set up with members from the Club and members from Sheep Shearing. 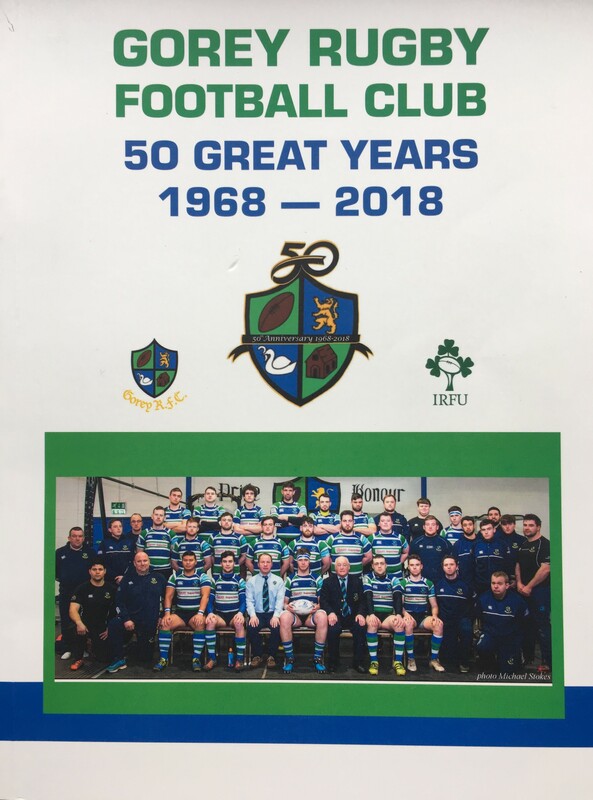 The Club members were: Jim French, Ger Williams, George Kidd, Willie Willoughby, David Bolger Jnr., George Steacy, Pat O'Donnell, Michael Wade, Frank Deering and Tommy Kidd. 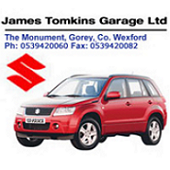 Have given great service to Gorey Rugby Club, both as players and committee members. Gorey, at times, were able to field five teams from Junior1 to Junior 5. The under-age section of the Club has been building up over the years. Declan O'Rourke gave great service to the under-age section over the years. The Swan with an Eel in his mouth - Industry, a good work rate, working together as a team to win the game. The Rugby Ball - you are a rugby man and will fight for each other. The Church - a sense of community, all with a common interest. 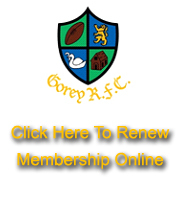 Gorey Rugby Club is best revealed through the thoughts and recollections of its Members. Willie Willoughby is one of our longest serving members whose dedication is appreciated by all. We would love to hear the thoughts and memories of others.